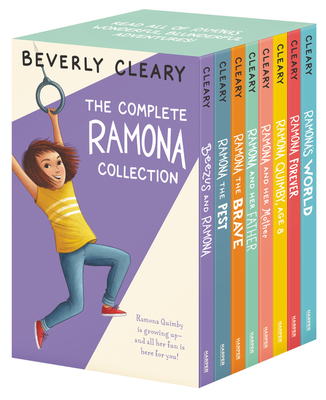 Whether a long-time fan of Beverly Cleary or a newcomer to her award-winning books for children, this eight-book box set of the complete Ramona Quimby series will be a perfect addition to any bookshelf. Kids everywhere feel connected to Ramona's unique way of looking at the world as she tries to adjust to new teachers, encounters bullies at school, and puts up with her bossy older sister. The scrapes she gets herself into—like wearing pajamas to school or accidentally making egg yolk shampoo—are funny and heartwarming, and sometimes embarrassing. No matter what, Ramona's lively, curious spirit shines through. Beverly Cleary is one of America's most beloved authors. As a child, she struggled with reading and writing. But by third grade, after spending much time in her public library in Portland, Oregon, she found her skills had greatly improved. Before long, her school librarian was saying that she should write children's books when she grew up. Instead she became a librarian. When a young boy asked her, "Where are the books about kids like us?" she remembered her teacher's encouragement and was inspired to write the books she'd longed to read but couldn't find when she was younger. She based her funny stories on her own neighborhood experiences and the sort of children she knew. And so, the Klickitat Street gang was born! Mrs. Cleary's books have earned her many prestigious awards, including the American Library Association's Laura Ingalls Wilder Award, presented to her in recognition of her lasting contribution to children's literature. Dear Mr. Henshaw won the Newbery Medal, and Ramona Quimby, Age 8 and Ramona and Her Father have been named Newbery Honor Books. Her characters, including Beezus and Ramona Quimby, Henry Huggins, and Ralph, the motorcycle-riding mouse, have delighted children for generations.